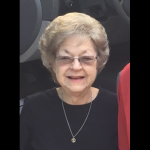 Sandra Lee Pokrywka, 78, of Kansas City, KS, passed away Thursday, August 10, 2018. Visitation will be from 10-11:00 AM with a Funeral Mass at 11:00 AM, Monday, August 20, 2018 at Christ the King Catholic Church, 3024 North 53rd Street, Kansas City, KS 66104. Burial in Mt. Calvary Cemetery. Sandra was born December 14, 1939, in Kansas City, MO. She retired as a Secretary for Brotherhood of Railway Carman. She was a member of Christ the King Catholic Church, the Altar Society, the Womens Auxillary for both the American Legion and VFW. Sandra was the past president of the Painted Hill Women's Golf Assn. She was preceded in death by her brother Caroll Sade. Sandra is survived by her husband of 63 years, Robert, son Steve (Traci) Pokrywka, daughter Cindy Pokrywka, granddaughter Natasha Lin Pokrywka and many extended family and friends. Steve, So sorry to read about the death of your Mom! Thoughts and prayers to you and your family! Sandy, was a inspiration every time she came in the Office, always cheering for her favorite \"Chiefs\", she never gave up on them always believing that this is the year! So anyone who has connections to get a word into the Chief Organization that's viewing this let's win this for SANDY!! as she would say GO CHIEFS!! May God give the Family a Peace that Surpasses all Understanding. Visitation will be from 10-11:00 AM with a Funeral Mass at 11:00 AM, Monday, August 20, 2018 at Christ the King Catholic Church, 3024 North 53rd Street, Kansas City, KS 66104.